Dezeen promotion: Dezeen is media partner for SuperDesign, an exhibition hosting international designers and galleries in London during the Frieze Art Fair next week from 14-17 October. The exhibition, which takes place at Victoria House on Bloomsbury Square, features work by designers including Tom Dixon, Michael Young and the Campana Brothers and galleries including The Apartment, Mitterand+Cramer and Vessel, plus our Dezeen Watch Store pop-up. The public view will take place from 10:00 to 20:00 on Friday 15 October, 10:00 to 18:00 on Saturday 16 October, and 10:00 to 16:00 on Sunday 17 October. Now in its fourth year, Super Design has cemented its reputation as London’s most important and innovative exhibition of contemporary design art. Set within the imposing venue of Victoria House, the exhibition will bring together collections from leading international galleries and pioneering designers at a crucial time in the art calendar year. Above: Issey Miyake Trapezoid watch at Dezeen Watch Store. Spread over 1,500 sqm of exhibition space, Super Design will feature specially commissioned, unique and limited edition pieces from world-class international galleries including The Apartment, D&A-Lab, Quadrige, Mitterrand-Cramer, Tom Dixon, Herve Van Der Straeten and Vessel Gallery among others. Devised by gallery owner Patrick Brillet, Super Design is a carefully curated event designed to showcase the ingenious capabilities of producers and designers and the inspiring collaborations that exist between the two. At this year’s Super Design, The Apartment will be premiering two new chandeliers from the lighting series ‘Digit’, developed by Milan based designer Emmanuel Babled. Working with Murano glass and creating extremely dense and chaotic configurations of orbs, Babled breaks free from the conventions of the classic Venetian chandelier with his latest works ‘Digit Superball’ and ‘Digit Linear’. The Apartment will also be launching Michael Young’s new ‘Newspaper Shade’, inspired by his walks through Hong-Kong where he discovered an old paper folding technique which he developed and evolved to create stable forms and structures. ‘Newspaper Shade’ is made from around 10,000 bits of old Chinese newspaper and is the largest item produced using this technique. Also being debuted is Young’s ‘Carbonlite’ floor lamp, inspired by his love of Japanese hanging lights. New work from Australian designer Brodie Neill will be presented by The Apartment including the seductive ‘Threefold’ light, a never ending aluminium surface in the form of a Mobius strip, radiating soft light from its striking sculptural centerpiece. A re-inter- pretation of Neill’s original solid surfaced ‘Reverb Chair’ will also be on display. 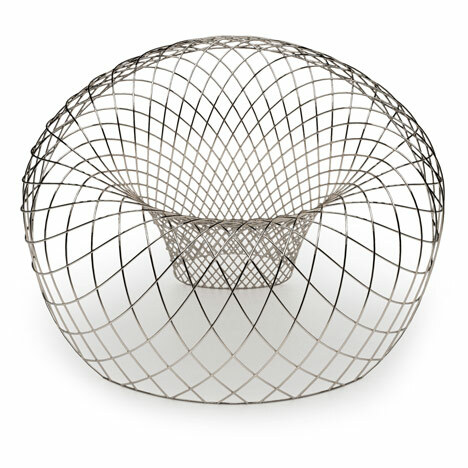 This wire frame version, the ‘Reverb Wire Chair,’ amplifies the original’s vortex feel while mirror polished stainless steel rods map the expanding geometry of the overall conical form. The Apartment will showcase the Origami Mirror Chair (welded & folded mirror stain- less steel) by Philip Michael Wolfson in a new variation of his early works from the Origami series. Wolfson examines the abstraction of penetration, folding, layering and juxtaposition, creating a collision of static versus dynamic forces. The use of mirror finish steel multiplies the characteristics of the Origami Chair thru amplifying both the movement within the piece itself, as well as the surrounding environment. The Apartment will debut Plug Light by Marcus Tremonto, inspired by French Pop comics of the 60’s. By manipulating and exaggerating size and form, the work forces the viewer to re-examine, question and consider the surroundings in which it exists, reminiscent of a cell in a comic or frame that tells a story. Geneva based gallery Mitterrand-Cramer, will be exhibiting new pieces from ‘Grey Derivations’, the latest furniture collection from rising global talent, Maarten Bass. Evincing the highest quality craftsmanship, the trademark of this Dutch designer, each piece is made of grey- and red-pigmented resin fixed on a steel frame. Mitterand-Cramer will debut Paris designer Arik Levy’s luminous new ‘Facet Moon Table’ and pieces from his ‘Abstraction’ sculpture series and the startling ‘Wireflow’ black random light. Furniture from Rotterdam’s multi-disciplinary Studio Makkink and Bey including ‘Kade Chair 1’, ‘de Amersfoot’ chair and ‘Bonsai’ table will be exhibited. Swiss pop artist Sylvie Fleury’s series ‘Miniland-Untitled’ will also be showcased. Internationally renowned British designer Tom Dixon will present the Flamecut series, an installation of unfeasibly heavyweight furniture cut from 1inch thick steel using the traditional process of flame cutting. The Cast series, a collection of abstract forms made from aluminium sand casting, and finished with a bright enamel coating will also be shown. Herve Van der Straeten will present a collection of one-off and limited edition pieces underlining the designer’s explorative approach. The Console collection (including pyschose, kasimir, piercing and cristalloide) a geometric explosion of overlapping cubes will form part of the display. The combination of balanced forms seemingly defies gravity creating the illusion of unattainable stability. Creative pioneers D&A Lab, will be exhibiting ‘The Low Table 1984’, a new piece from British artist Jonathan Monk, part of its 2010 Designed by Artists Collection: Relative Objects, which challenges contemporary artists to translate their aesthetic vision into functional pieces of design. Monk’s piece was inspired by renowned artist Donald Judd’s iconic metal ‘Bookshelf’ created in 1984. Monk’s reinterpretation was made by laying the bookshelf on the floor, rearranging the individual elements into a low table. The multi- coloured piece uses the same RAL colour palette in which the original bookshelf was made. At Super Design Vessel Gallery will launch a series of lighting projects from both internationally acclaimed artists - Olgoj Chorchoj to new talents such as Marco Dessi. Each project is produced in a limited edition, focusing on the craftmanship and quality of the work. In contrast to the lighting Vessel will also showcase a selection of artglass from the greatest artists collaborations they have shown in the last ten years, featuring artists such as Lena Begstrom, Baldwin and Guggisberg, Rony Plesl and Katy Holford. Super Design seeks to emphasise the current synergy between design and the visual arts with innovative and ground breaking displays that present modern design in a fresh and invigorating light, in an inspiring location at the heart of the capital. Patrick Brillet opened his first gallery in London, dedicated to post-war design, in the early eighties. Since then he has curated private and public museum collections throughout the world, acting as a design consultant to a number of major auction houses. In recent years he has commissioned and produced studio pieces with both established and up-and-coming 21st century designers. In December 2005, he formed The Apart- ment gallery in partnership with Isabelle May. They now work with some of the world’s most renowned designers including Emmanuel Babled, Johanna Grawunder, Brodie Neil, Ross Lovegrove, Marcus Tremonto, Philip Michael Wolfson, Michael Young among others producing stunning and stimulating work and carries an extensive collec- tion of pieces by design luminaries including Ron Arad, Marc Newson, the Campana Brothers, Ettore Sottsass. The Apartment Gallery Set within an intimate living space, The Apartment is a private gallery showcasing pieces by leading designers and select contemporary of both established and emerging talent, where collectors can buy quietly and privately in situ.